By default, Veeam Backup & Replication searches for restore points on all backup repositories configured in the backup infrastructure. However, you can select backup repositories in which Veeam Backup & Replication must search for restore points of selected machines. At the Objects step of the wizard, click Source. Choose backup repositories on which restore points must be searched for. You can select all backup repositories configured in the backup infrastructure or define specific backup repositories. You can limit the search scope to backup repositories if you have added machines to the backup copy job using the From infrastructure and From backups options. 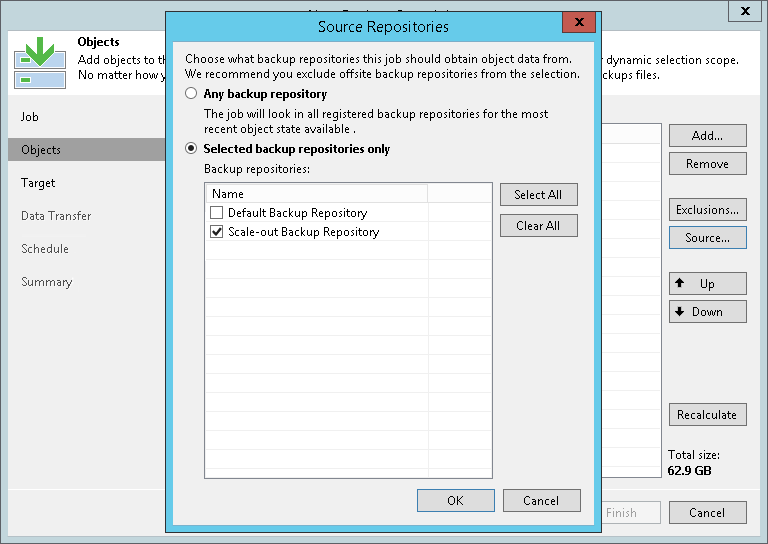 If you have used the From jobs option, the Selected backup repositories only option will not be applied, and Veeam Backup & Replication will retrieve data from the backup repository where the backup created with the source backup job resides.